Norfolk – Norfolk Tales, Myths & More! The men of E Company had grown up together, playing cricket for the same village team, chasing the same girls and drinking in the same pubs and inns. And now, as members of the 5th Territorial Battalion the Royal Norfolk Regiment, they were about to go to war together. It was during the hot August of 1914 when groups of friends, team-mates and work colleagues from across Britain eagerly enlisted to fight the Bosch. But what the soldiers of E Company, 5th Territorial Battalion the Royal Norfolk Regiment, had in common was something rather unusual: they all belonged to the staff of the Royal Estate at Sandringham. The company had been formed in 1908 at the personal request of their employer, King Edward VII. He asked Frank Beck, his land agent to undertake the task. This he did, recruiting more than 100 part-time soldiers or territorials. As was the custom in the territorial battalions of the day, military rank was dictated by social class. 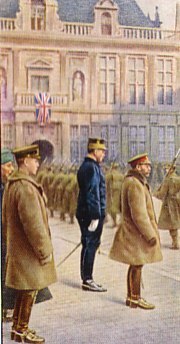 Members of the local gentry like Frank Beck and his two nephews became the officers. The estate’s foremen, butlers, head gamekeepers and head gardeners were the NCOs. The farm labourers, grooms and household servants made up the rank and file. What happened to the Sandringhams during the disastrous Dardanelles campaign in the middle of their very first battle, on the afternoon of August 12, 1915? One minute the men, led by their commanding officer, Sir Horace Proctor-Beauchamp, were charging bravely against the Turkish enemy. The next they had disappeared. Their bodies were never found. There were no survivors. They did not turn up as prisoners of war. – They simply vanished! General Sir Ian Hamilton, the British Commander-in-Chief in Gallipoli, appeared as puzzled as everyone else. He reported: ‘there happened a very mysterious thing’. Explaining that during the attack, the Norfolks had drawn somewhat ahead of the rest of the British line’. He went on ‘The fighting grew hotter, and the ground became more wooded and broken.’ But Colonel Beauchamp with 16 officers and 250 men, ‘still kept pushing on, driving the enemy before him.’ ‘Among these ardent souls was part of a fine company enlisted from the King’s Sandringham estates. Nothing more was ever seen or heard of any of them. They charged into the forest and were lost to sight and sound. Not one of them ever came back.’ Their families had nothing to go on but rumours and a vague official telegram stating that their loved ones had been ‘reported missing’. King George V could gain no further information other than that the Sandringhams had conducted themselves with ‘ardour and dash’. Queen Alexandra made inquiries via the American ambassador in Constantinople to discover whether any of the missing men might be in Turkish prisoner-of-war camps. Grieving families contacted the Red Cross and placed messages in the papers, hoping for news of their sons and husbands from returning comrades. But all to no avail. So what really happened to men of Sandringham? Along with thousands of other troops, the 5th Battalion of the Norfolk Regiment had set sail from Liverpool on July 30, 1915, aboard the luxury liner Aquitania. At 54, Captain Beck need not have led his men to war. But despite his age, he was determined to do so. ‘I formed them,’ he said bravely, ‘How could I leave them now? The lads will expect me to go with them; besides I promised their wives and children I would look after them’. A detail from a memorial window at the church at Aldburgh. Depicting the regimental badge, it commemorates the men who died in the Suvla Bay operations at Gallipoli. From the Broads Marshman collection. – To continue…….. The battalion landed at Suvla Bay on August 10, in the thick of the fighting, and was immediately ordered inland. Officers and men were being continually shot down, not only by rifle fire from the enemy in front of them, but by snipers. The climate was broiling by day and freezing at night. Men were already suffering from dysentery and from the side-effects of inoculations and seasick tablets administered during the voyage. There was a desperate lack of water – two pints were supposed to last each man three days. Then, on August 12, just two days after they had arrived in this arid, hostile land, the 5th Battalion was told it was to attack that afternoon. The orders were confused. Some thought the plan was to clear away the enemy’s forward positions in preparation for the main British assault. Others believed their target was the village of Anafarta Saga on the ridge ahead of them. The officers were handed maps, which they soon discovered did not even show the area they were supposed to be attacking. Having been in the baking sun all day the inexperienced troops were thirsty and scared – and now they were to launch a major assault on a well-armed enemy in broad daylight and with little cover. Only Private George Carr, a 14-year-old Norfolk lad, was to survive the bloodshed of that afternoon. Exhausted by the battle, he was saved by a stretcher-bearer called Herbert Saul, a pacifist who refused to carry a rifle on principle. At 4.15-pm whistles blew and the Norfolks began to advance, led by Colonel Beauchamp, waving his cane and shouting: ‘On the Norfolks, on.’ Captain Beck was at the head of the Sandringhams. Even though they were still a mile-and-a-half from the Turkish positions, the order to fix bayonets and to advance at the double was given. The slaughter began immediately as the Turkish artillery trained in on the advancing British soldiers. By the time the Norfolks reached the enemy lines they were already exhausted. A desperate battle ensued, officers and men being cut down all around by snipers hidden in the trees. Everywhere officers and men of the battalion were dying. A shell landed close to Frank Beck. He was last seen sitting under a tree with his head on one side, either dead or simply too tired to continue.In the midst of the bloodshed, Colonel Beauchamp continued to advance through a wood towards the Turks’ main positions, leading a band of 16 officers and 250 men. Among them were the Sandringhams. Eventually, the Colonel was spotted, standing with another officer in a farm on the far side of the wood. ‘Now boys,’ he shouted, ‘ we’ve got the village. Let’s hold it.’ That was the last anyone saw or heard of Beauchamp, or any of his men, including the Sandringhams. They had all disappeared, amid the smoke and flying bullets, never to be seen again. In 1918 when the war had ended, the War Graves Commission searched the Gallipoli battlefields. Of the 36,000 Commonwealth servicemen who died in the campaign, 13,000 rested in unidentified graves, another 14,000 bodies were simply never found. During one of these searches a Norfolks regimental cap badge was found buried in the sand along with the corpses of a number of soldiers. The find was reported to the Rev Charles Pierre-Point Edwards, MC, who was in Gallipoli on a War Office mission to find out what had happened to the 5th Norfolks. It was likely that he had been sent there by Queen Alexandra. Edwards’ examination of the area where the badge had been found uncovered the remains of 180 bodies; 122 of them were identifiable from their shoulder flashes as men of the 5th Norfolks. The bodies had been found scattered over an area of one square mile, to the rear of the Turkish front line ‘lying most thickly round the ruins of a small farm’. This, Edwards concluded, was probably the farm at which Colonel Beauchamp had last been seen. The surrounding area was wooded, the only area in the Suvla vicinity that matched with General Hamilton’s description of a forest. Four years later came news from Turkey of a gold fob-watch, looted from the body of a British officer in Gallipoli. It was Frank Beck’s. The watch was later presented to Margeretta Beck, Frank’s daughter, on her wedding day. And so it is here that the story of the Vanished Battalion might have ended. Many years later, in April 1965, at the 50th anniversary of the Gallipoli landings, a former New Zealand sapper called Frederick Reichardt issued an extraordinary testimony. Supported by three other veterans, Reichardt claimed to have witnessed the supernatural disappearance of the 5th Norfolks in August 1915. According to Reichardt, on the afternoon in question he and his comrades had watched a formation of ‘six or eight’ loaf-shaped clouds hovering over the area where the Norfolks were pressing home their attack. Into one of these low lying clouds marched the advancing battalion. An hour or so later, the cloud ‘very unobtrusively’ rose and joined the other clouds overhead and sailed off, leaving no trace of the soldiers behind them. This strange story first appeared in a New Zealand publication. Despite its unreliable provenance and inconsistencies (Reichardt got the wrong date, the wrong battalion and the wrong location), this version of events captured popular imagination at that time. More recent and detailed research for a BBC television documentary in 1991 called “All the King’s Men.” suggested that Reichardt’s story of the battalion-lifting cloud may have been a little confused. More significantly the BBC research unearthed two new important items of evidence. The first piece of new evidence was an account of a conversation with the Rev Pierre-Point Edwards some years after the war, which revealed an extraordinary detail he omitted from his official report about the fate of the 5th Norfolks – namely, that every one of the bodies he found had been shot in the head. It was known that the Turks did not like taking prisoners. This was confirmed by the second piece of evidence, which told the story of Arthur Webber, who fought with the Yarmouth Company of the 5th Norfolks during the battle of August 12, 1915. According to his sister in-law, Arthur was shot in the face. As he lay injured on the ground, he heard the Turkish soldiers shooting and bayoneting the wounded and the prisoners around him. Only the intervention of a German officer saved his life. His comrades were all executed on the spot. Arthur Webber died in 1969, aged 86, still with the Turkish sniper’s bullet in his head. Can the true fate of the 5th Battalion now be more fully explained? So they were butchered…and buried. Is this what became of the Vanished Battalion? Update: Steve Smith, author of ‘And They Loved Not Their Lives Unto Death: The History of Worstead and Westwick’s War Memorial and War Dead’, has written an article “5th Battalion Norfolk Regiment – The True Story” which is reproduced on this site – it may shed some light on the fate of the Vanished Battalion. Author norfolktalesmythsPosted on April 11, 2019 Categories 20th Century, east anglia, Historic Tale, Kings Lynn, Military, Myths, Norfolk, Stories, West Norfolk, World War 1Leave a comment on The Lost Sandringhams! “I make my money from the mustard that people throw away on the sides of their plate”. Pockthorpe Towermill 1885. Photo via Norfolk Mills. ‘Old’ Jeremiah Colman, as he was to be known in later life, was originally a farmer and had also owned Bawburgh Mill. He had no children and was to adopt James, the eldest of his brother Robert’s fifteen children. Jeremiah was a devout Baptist, kindly, honest and a good master. Jeremiah Colman bought Pockthorpe smockmill in March of 1804 and sometime during the next ten years he demolished the old mill and replaced it with a towermill; to be known as either Bagshaw’s Mill, Bayfield’s Mill or St Paul’s Mill. The towermill had six floors and stood on land between Magdalen Road and Silver Road, approximately where Knowsley Road was later laid. After ten years had passed, Jeremiah Colman branched out when he leased Stoke Holy Cross watermill on the 3rd April 1814. He bought it as a going concern and paid £51 2s 0d to Edward Armes for his stock of mustard. This is the point where the story of Colman’s Mustard really begins. It was from this moment when Old Jeremiah plotted his Company’s prosperous 50-year period at Stoke and gradually introduced a range of products, starting with the introduction of starch manufacturing. Under his ownership, between 1814, when he set up at Stoke, and 1851 when he died, wages rose regularly – although employees, including 8 and 9-year old boys, worked 12 hour shifts with two breaks and wages were 3d per hour. The working day for employees was normally from 6.00am to 6.00pm, although sometimes a shift could go on until midnight when some workers faced a long walk home. ‘Old’ Jeremiah had no children whilst his brother Robert, who was farming at Rockland St. Andrew, had fifteen – eleven of them were boys. It was the eldest, named James, who was adopted by Jeremiah, brought up and when he became 22 years of age, Jeremiah took him into his Company and gifted him partnership; the date was 15th February 1823. This date proved to be a significant date for the future development of Colman’s Mustard, because from that point Jeremiah shared the management burden of looking after a growing business, which in turn, opened up further job prospects for many people in and around Norwich. Young James began with a quarter share which increased to one-third in 1827 and half in 1831. 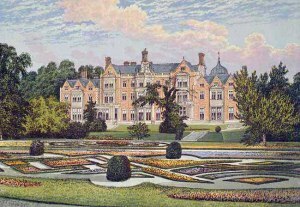 Later on, two other brothers, Jeremiah the 2nd and Edward who were to represent the business in London, were also admitted into partnership; but this was not until 1844, six years before land was purchased at the Carrow Abbey district of Norwich for further expansion of the Company. Stoke Holy Cross Mill, 1880. Then, on the 3rd December 1851, “Old” Jeremiah died; he was aged 74 years. Barely two years later, on the 24th November 1853 James Colman, his adopted nephew and successor, also died. It was his 24-year-old son, Jeremiah James Colman, who took over full control of the family business – he being the third member of the family to do so. An advert from 1855 which shows the London head office of Colman’s Mustard in Cannon Street. Photo: (c) Unilever. Young Jeremiah J Colman now controlled what was still a small local company selling modest amounts of mustard and starch. However, in the space of 50 years he was to build, what was essentially a mustard company, into a global brand by using innovative marketing techniques, hard-work, honesty and integrity. J.J. Colman also proved to be a brilliant innovator whose masterstrokes included creating Colman’s famous Bull’s Head trademark in 1855 and moving, in 1858, from nearby Stoke Holy Cross to a site at Carrow Abbey in Norwich. His decision to leave Stoke Holy Cross was brought about partly by an uncertainty about the lease renewal, coupled with the obvious advantage of working near to river and rail transport links which the City of Norwich offered. The young entrepreneur had also identified a ready-made workforce in the city – cloth workers made redundant by the decline of the textile industry in Norfolk and its exodus to northern mills. Colman’s Carrow Factory, circa 1850’s. Photo: J Stewart. The mid-19th century was a time of great poverty in Norwich following the dwindling of the textile industry. Land was cheap and labour plentiful. The grounds of the historic Carrow Abbey were selected as the site for the new factory and, without planners to satisfy, the Carrow mustard mill was working by 1858. Before long, flour and mustard mills began to appear along the bank of the river, with engine houses, granaries, and stores. The Company’s ‘Counting House’, still identifiable today, was built shortly afterwards for use as the administrative headquarters. A second millenium view of Jeremiah Colman’s 19th century home, known as ‘Carrow Abbey’. The figures on the left are entering Colman’s Mustard canteen. Photo: via Fanny Cornforth. Colman’s School built on Carrow Hill in 1864. Photo: Norwich Museum Service. The truth was that the Colman family had always taken a benevolent interest in their workforce and, increasingly as the Company grew, they not only supplied schooling but contributed to the social life of its staff; for example: Christmas dinners in the granary, staff outings, a meals service for its workers – 4p bought hot meat, vegetable stew and a pint of coffee. Colman’s also provided a clothing club and lodgings for working girls, followed by a lending library and a pension fund; but these benefits were provided once the Company had grown to many hundreds of employees at the Carrow Works in Norwich. In 1872 he set up a self-help medical club for his workers, encouraging them to contribute, matching their contributions with his own donations. Then, in 1878, the Company established a nursery for younger children, and employ an industrial nurse, called Phillipa Flowerday; plus, a dispensary set up for the benefit of his workers. Colman’s were also to build coffins for workers and their families, and build and rent out houses to workers and pensioners. The company owned hundreds of homes and accommodation was provided for many workers, but special provision was made for single women who were provided with low-cost accommodation. Most houses were in neighbouring Lakenham and Trowse, and some of the terraces were said to have had mustard-coloured front doors. He even provided public houses in which his workforce could enjoy a pint or two. – And, it did not stop there! Former Colman Cottages built in School Terrace, Norwich by the Company for employees. Photo: Broads Authority. An onsite kitchen was opened, this provided tea or coffee in the morning and a hot meal for lunch, charged at cost. Workers who were off sick long term would have food parcels delivered to them at home courtesy of the Company; to do this, somebody was employed full-time to deliver these food provisions. A clothing club was also established; this made saving towards the cost of clothing much easier. Additionally, the company contributed to the savings scheme. From 1874 a dressmaking teacher was hired to help female employee’s learn new skills that could be used in the home and save money. In fact, a whole series of educational classes were provided free of charge to all employees. Jeremiah Colman then insisted that his employees were insured against sickness or injury, the Company ran its own scheme for workers who could choose between that or joining a Friendly Society. From 1864 the dispensary employed a doctor to work alongside the nurse. Hand tinted glass plate showing thousands of workers leaving Colma’s Carrow works in 1900. Photo: (c) Unilever BNPS. In 1856, Colman’s employed just 200 people, by 1862 this had risen to 600 and by the time of his death in 1898 it was closer to 2,000. The story of the rise of Colman’s and of the work and life of Jeremiah James Colman is fundamental to understanding the history of Norwich in the 19th century. Colman’s influence could be seen everywhere and his morals, actions and achievements drastically altered the lives of many thousands of people living in Norwich. This rapid growth of Colman’s Mustard ran counter to the general narrative of English 19th century industrial growth. In an age characterised by child labour, unsafe working environments and long hours for low pay, Colman displayed a remarkable duty of care to his employees. Many industrialists of the time in this country claimed they could ill afford to treat their workers better or pay them more; to do so, would destroy their business and the nation’s economy. Jeremiah Colman proved that it was possible to grow a profitable business whilst treating workers with humanity and giving them some form of dignity. Jeremiah James Colman 1830-1898. Photo: Norwich Museum Service. When Jeremiah James Colman died, he left £2,000 in his Will to the employee’s trust and the money from this was used to set up a pension fund. By the time he had departed Colman had built up a system of nurseries, schools, medical care, food provision, housing and pensions. A system of protection for his workers from cradle to grave – 50 years before the creation of the welfare state! Carrow Works, circa 1890. Photo: Public Domain. Why did Colman feel the need to provide such assistance? He could very easily have turned a blind eye to the plight of his workers, like the majority of his contemporaries did. He was no social revolutionary, in an age of socially radical ideologies Colman was politically a liberal. He was however a devout Christian paying strict adherence to the Protestant religion. This drove his belief in a strong work ethic but also his compassion for his fellow man and his ethical approach to business. Colman’s brand of charity was that of self-help, he believed in giving to help people, but he believed that once helped people had a duty to do everything in their power to help themselves. ‘anything I can do to promote the principles I have always supported … I am glad to do, but I much prefer that it should be without the reward or rank a title is supposed to give’. A Norfolk wherry moored outside the Carrow works in 1900 – the sailing barges were used to transport the mustard plants to the factory. Photo: (c) Unilever BNPS. ‘Men should go into municipal affairs to see what they could do for the town, instead of seeing what the town could do for them’. At the young age of 29 he was elected to Norwich Town Council. He was sheriff in 1862-63, mayor 1867-68, in 1869 he became a magistrate for Norwich and then for Norfolk in 1872. In 1871 he was elected as a liberal MP for Norwich, serving for 25 years but his political career was mixed. He did not thrive in the Houses of Parliament as a Liberal MP, in part due to his poor oratory skills, but also because he very quickly became disillusioned with national politics. He was however much more successful as a local politician he sought to end the corruption for which Norwich was well known. Female workers packing penny oval tins in 1910. Photo: (c) Unilever BNPS. He was a part of Norwich Young Men’s Mutual Improvement Society, this group met regularly and spent their time writing, reading and debating the great questions of the day focusing on politics, religion, society, and morality. He was closely involved with the successful launch of the Eastern Daily Press in 1870; a newspaper that is still going strong today. He also fought for, and won, having a preservation order placed upon the Norwich City Walls – or what was left of them after the City had decided to remove the ancient city gates in the previous century. Staff packing at the Carrow factory in the 1920’s. Photo: (c) Unilever BNPS. Colman was one of the leaders of a subscription campaign that sought to argue for all public buildings in Norwich being used for the public benefit. By 1886 they had been successful in securing both the Castle and Blackfriars Hall for public use. At the time Colman was a trustee of Norwich Museums, whose collections were then housed in a purpose-built building on Exchange Street. After closing as a prison, the castle was offered to both the city and county councils for purchase, but they were unwilling to meet such expense. Briefly the decision had been made to allow the castle to become a ruin, however banker John Henry Gurney purchased the castle, and it re-opened as the museum we know today. So how was a small local company able to transform itself into one of the top 100 British companies in just under 50 years, whilst simultaneously providing a decent living for its workforce? Well, Marketing was the key to their success, and Jeremiah James Colman was the man driving this forward. In 1855 they adopted the now instantly recognisable bright yellow packaging with the distinctive bull’s head and in 1865 they gained a royal warrant from Queen Victoria. Colman’s products are still used by the Royal household today. They were one of the first companies to really push forward the marketing of their products to a consumer market. As early as the 1840’s Colman’s made the decision to start selling their products in much smaller packages (penny tins). This enabled smaller amounts to be purchased more cheaply which opened up a huge new potential customer base. Railway carriages were decorated in the distinctive brand colours to transport their goods across the country. Before the age of Television this allowed the whole country to see the Colmans imagery. By the 1870’s Carrow had its very own marketing department, and by the late 1890s they had started hiring famous artists to create high quality advertising posters for them. Including the illustrator John Hassall and later the painter Alfred John Munnings. The growth of the business rested on the increasing nationwide and world-wide demand for the limited ranges of its quality products, and on what today would be known as good marketing. The selling and marketing were carried out by other members of the Colman, and carried on through their sons and grandsons from the Company’s Cannon Street offices in London. In 1896 an important change took place in the structure of Colman’s Mustard when the partnership became a limited company with a capital of £1,350,000. The first chairman was Jeremiah James, who was succeeded after his death two years later by one the London cousins, Frederick Edward Colman. The growth of Colman Mustard over 150 years or so did not come about solely by the introduction of new products, methods of manufacture, and increasing sales. These played their part, but so did the Colmans’ gift of creating the means by which competing firms could be taken over. This policy of expansion by acquisition appears to be as old as the 20th century, for it was in 1901 that a rival starch-making firm of Orlando Jones & Co. was absorbed. Two years later, principally interested in their competitor’s mustard and spice trade, Colmans took over Keen Robinson & Co., but found they had become one of the most important baby-food manufacturers in the country through sales of Robinson’s Patent Barley and Patent Groats. Keen Robinson & Co 1925. Photo: (c) Robinsons. The period up the first world war marked the continued transformation of Colmans from a paternal 19th century business employing a great deal of labour, and relatively little mechanised, to one using mechanical processes tending towards automation, and backed by the different financial approach of the limited company. Then in 1936, Colmans became a public company and two years later, in 1938 joined forces with Reckitt’s of Hull to become Reckitt & Colman Ltd. The amalgamation was in the fateful year of Munich when, to all but the optimists, war was inevitable. Carrow Works was severely damaged by air raids during the war. One in 1941 destroyed four buildings including the cereal and mustard departments and a year later the seed granaries, starch, blue and advertising departments were blitzed. In 1943, six months after his son Alan had been killed while flying as a war-time ferry pilot, Mr. Russell Colman retired from the board. For the first time for 130 years there was no Colman on the Norwich branch among the directors. In the main the heavy burden of carrying on the business under the difficulties of wartime fell on the shoulders of Sir Basil Mayhew and Mr. H. A. G. Salter. Destruction: The Carrow Works following one of the WW2 Luftwaffe raids. Photo: Norfolk County Council. In 1945 the Reckitt & Colman Group was joined by another large business, Chiswick Products Ltd., manufacturers of polishes and similar lines, building up towards what were a world-wide range of foods, wines, soft drinks, household goods, toiletries, pharmaceuticals and industrial and other products. Probably the most significant developments of recent years were the acquisition in 1968 of the Norwich-based wine company Coleman & Co., long known for its tonic wine, Wincarnis. Because of the similarity of names many people thought that this was always a Colman product, but until 1968 it was not, although a hundred years before Colmans bought up Colemans of Bury St. Edmunds, a small mustard and starch manufacturer. The proprietor, Mr. W. J. Coleman, a chemist, then developed the tonic wine. Colemans had by this time become a considerable business as shippers and distributors of branded wines. Reckitt & Colman extended it by further acquisition of the business of Edward Robinson and, in 1969, of Moussec sparkling wine. When the Colman family picked the site around the old Abbey at Carrow something like 160 years ago, they were really looking ahead. Despite automation, computers, and mechanical processes not dreamed of by the early employees who put the mustard into large and small containers by hand, there was a sizable number of workers in the Food & Wine Division in Norwich. It was a point touched upon by Mr. James Cleminson, who came to Carrow in 1960, was appointed managing director of the food division in 1970, and then went on to become chief executive of the then £200 million parent company, Reckitt & Colman Ltd. At the 150th Anniversary of Colmans in 1973, James Cleminson said that it was appropriate that the Company should acknowledge the debt owed to predecessors when he opened a mustard shop in Bridewell Alley in Norwich. The Mustard Shop in Bridewell Alley, Norwich. Photo. EDP. In 1995, Colman’s became part of Unilever’s Van Den Bergh Foods when it was purchased from Reckitt & Colman PLC. As part of the acquisition, Unilever acquired the dry sauces, condiments and mustards sold under the Colman’s brand name. In 2018, Unilever confirmed that it would close its base [Colmans] in Norwich! They went on to say that a transition period of moving production from Norwich to Burton-upon-Trent and Germany would begin in the autumn of 2018 and would continue until the end of 2019. To sweeten a bitter pill for many, Unilever said that it planned to open a new milling facility near Norwich for the production and packing of Colman’s mustard powder! Author norfolktalesmythsPosted on April 4, 2019 Categories 18th Century, 19th Century, 20th Century, east anglia, Georgian, Georgian Period, Historic Tale, Norfolk, Norwich, Stories, VictorianTags Carrow, Colmans, Mustard, Pockthorpe, Stoke Holy Cross1 Comment on The Profit On The Side Of The Plate! The ‘Spring’ or ‘Vernal Equinox’, which was once called ‘Ostara’, occurs on either 20th, 21st or 22nd March when the sun enters ‘Aries’ according to the Earth’s orbit and the insertion of leap years. The Spring Equinox marks the time when the sun crosses the celestial equator northwards or the ‘half way point’ resulting in equal twelve hours of day and twelve hours of night. At the equinox the sun rises exactly in the east and sets exactly in the west after which the daylight hours grow increasingly longer until the sun reaches its highest point in the sky at the ‘Summer Solstice’, which occurs in June. Have you ever wondered how the symbol of the rabbit became associated with the Easter Festival? The origin of the Easter Bunny probably goes back to the festival’s connection with the pagan goddess Eostre. Eostre (sometimes spelt Oestre) was a fertility goddess from whom we derive the word “oestrogen” and she is closely associated with fertility symbols such as eggs. The rabbit is known as a highly fertile creature and hence an obvious choice for Easter symbolism. In fact the use of the rabbit is probably a mistake – the Easter “bunny” is more likely to have been a hare, since it is the hare that is usually considered the sacred creature of Eostre. Pagan fertility festivals at the time of the Spring equinox were common. It was believed that at this time, when day and night were of equal length, male and female energies were also in balance. The hare is often associated with moon goddesses; the egg and the hare together represent the god and the goddess respectively. The earliest known reference to our modern Easter Bunny tradition appears to be from 16th century Germany. In the 18th century, German settlers to America brought the tradition with them. The Bunny was known by them as Oschter Haws (a corruption of the German Osterhase ) and brought gifts of chocolate, sweets and Easter Eggs to good children. Often children would make up nests for Oschter Haws, sometimes using their Easter bonnets, and the Bunny would leave his treats there. It is because of this strong connection with pagan traditions that Hares were strongly associated with witches and witchcraft in Christian times. 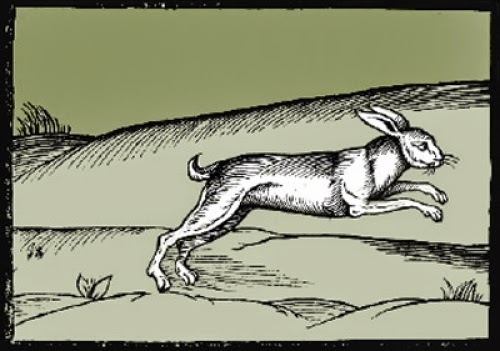 People claimed that a witch could shape shift her form at night and become a hare. These solitary creatures, rarely seen, sometimes standing on their hind legs like a person, aroused suspicion. When in distress they uttered a strange, almost human-like cry, which gave the animal a supernatural quality. For its behaviour would mimic that of a supposed witch. In this form she stole milk or food, or destroyed crops. Others insisted that hares were only witches’ familiars. Author norfolktalesmythsPosted on March 24, 2019 Categories Art/Literature, east anglia, Easter, Myths, Norfolk, StoriesTags March HaresLeave a comment on March Hares & Witches. Author norfolktalesmythsPosted on March 22, 2019 Categories 19th Century, east anglia, Historic Tale, Norfolk, StoriesTags John Curwen, Music, Sarah Glover, St Lawrence ChurchLeave a comment on Norwich’s Pioneer in Music Education.